HowAboutWe.com is all about taking the online out of online dating. More than one million members are enjoying a fresh, date-centric approach, which matches users by their interests, rather than a set of online categories. And you won’t have to wait for long for a date either, thanks to the “Tonight” feature, which arranges a date for this evening in just seconds. There are plenty to choose from, including some genuinely innovative tools. Some of the most impressive features include discounts on shows and restaurants, while the “Play” tab allows you to speed date your way to finding someone special. Speed is also the name of the game with the “Tonight” feature which will secure a date for you within fifteen seconds at a venue which appeals to you both. And if you want to know where the dating possibilities are, there is a convenient dating map to see who is available and where. Meanwhile, “The Pool” provides a constant stream of potential dates matching your preferences. Perhaps the most noticeable feature though, which sums up the HowAboutWe ethos is the basic requirement to pitch a date idea rather than an eye-catching profile status. This is a site which prioritizes fun dating. HowAboutWe has struck a great balance between a sign up process that,not only doesn’t take up too much time, but which also allows you to tell the world about yourself. You will be required to submit basic information, such as age, location, password and e-mail address. However, you will also have the opportunity to describe yourself in a little more detail thanks to the “About You” and “A few more basics” sections, in which you will be asked your thoughts on politics, smoking, drinking and more. If you want to provide a detailed picture of yourself, there are a number of short fun essay-style questions at your fingertips. All users must submit a picture on sign up. Once you have selected your best shots, you will be free to start browsing. You are be able to use the site with absolute peace of mind. There are plenty of important technical security tools in place including SSL encryption and a firewall. Meanwhile, there are some useful dating tips to help ensure your safety both online and offline. And if you are particularly concerned over suspicious activity, users can be reported to site administrators. Free membership enables you to browse the site, create a profile and post a “How about we…” dating idea. However, if you want to send messages and truly interact with other users, then you will need to pay. There are two tiers of membership. The “Basic” package will set you back $15.99 per month for a 3-month agreement, while a 6 month deal costs $12.99 per month and a 12-month deal works out at $9.99 monthly. “Premium” members receive enhanced benefits including an absence of adverts and anonymous browsing. 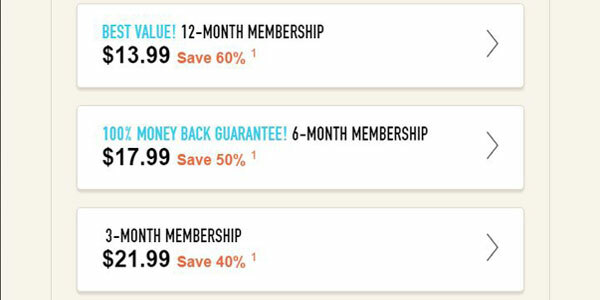 The cost is $21.99 each month for a 3-month package, $17.99 monthly for 6 months and a full year will cost $13.99 per month. It is also well worth noting that there is an impressive 100% money-back guarantee if you don’t find a date at all. This is a different, but yet intuitive platform to use. The design is smart and streamlined and so you should find it straightforward to find your way around. The most striking design feature is the centrality of the “How about we…” suggestion. The more you pitch a date idea, the more likely you are to interact with other users and get the most out of the site. In addition, your personal dashboard places you just a click away from searching, viewing your connections, assessing the “pool” of options and arranging a date for this evening. Conveniently, you can also link your HowAboutWe.com account with your social media accounts, allowing other users to really find out more about you. There is also a simple to use app available across mobile platforms, where functionality could barely be simpler, requiring just a double tap on profiles which interest you to arrange a date. There are several automated search tools at your disposal. 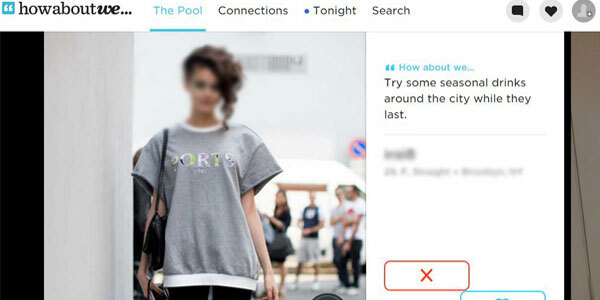 “The Pool” suggests profiles based on your activity and information. All you need to do is choose whether to “like” or “pass” as you scroll through the options. Meanwhile, a selection of “Daily Dates” ensures a daily dose of suggested matches too. If you wish to conduct your own search, you will find a fairly extensive basic search including criteria such as physical attributes, education and political outlook. The advanced search is even more comprehensive, including photos and date ideas. In addition, you can also search via keyword to hone in on any specific attribute. There are plenty of excellent dating sites, but this HowAboutWe review can only conclude that there is none quite as creative and inventive as this. There is a real focus on shifting dating away from the virtual online world to real life. However, if you are more focused on finding a long-term partner, rather than casual dating you may want to check out our Zoosk.com review. HowAboutWe is packed with innovative features within a very usable platform. And with a guaranteed refund if you don’t find a date, there is nothing to lose by signing up and exploring this excellent site for yourself.